Ovarian cancer often doesn’t cause any symptoms until after it has spread outside the ovary. Even then, symptoms are often subtle and similar to other more common diseases. That’s why women need to be familiar with ovarian cancer symptoms, and know what your next steps should be if you notice them. “It’s important to see your health care provider if you have any of these symptoms,” says gynecologic oncologist M. Bijoy Thomas, MD. Only a health care provider can tell if you have cancer. If you have any of the above symptoms, or a strong family history of cancers especially ovarian cancer, your health care provider will perform a complete physical examination and order additional tests if there is a gynecologic concern. The test might include a pelvic ultrasound to evaluate the uterus and the ovaries, or computed tomography (CT) scan of your abdomen and pelvis to check the entire abdomen. In addition your provider might recommend a blood test called Cancer Antigen 125 (CA 125). The results of CA 125 are useful only in context of the other tests and a complete physical examination. Many conditions other than cancer can cause CA 125 to rise including normal menstrual period, ovulation, inflammatory disease, recent surgery, and noncancerous gynecological problems like endometriosis. “Having a higher CA 125 result doesn’t always mean you have cancer. Many conditions other than cancer can cause CA 125 to rise. Early ovarian cancer can even have a normal value of CA 125. ” says Thomas. All the test results have to be carefully interpreted by a qualified health care provider. If your provider has concerns after reviewing the test results, you should be seen for further evaluation by a board-certified gynecologic oncologist who specializes in cancers of female reproductive system. 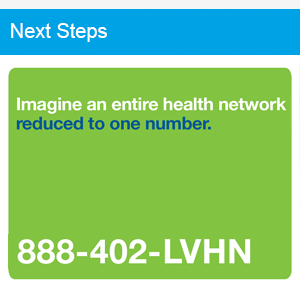 Learn more about cancer care near you by visiting LVHN.org/CancerInstitute.